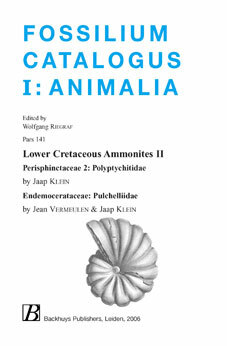 ﻿ Jaap Klein & Jean Vermeulen: Fossilium Catalogus I: Animalia, pars 141: Lower Cretaceous Ammonites II. I received many positive reactions to the first volume of Fossilium Catalogus Lower Cretaceous Ammonites from colleagues. This second volume may be of interest to them as well, for it deals with two very unique families. The family Polyptychitidae from the uppermost part of the Jurassic (Upper Volgian) and the Berriasian, Valanginian and Hauterivian stages of the Cretaceous, are mainly restricted to Boreal and Subboreal regions and are descendants of the Jurassic Dorsoplanitinae. Some presumed Polyptychitidae from the western Tethys and the southern hemisphere are treated in an appendix. The family Pulchelliidae from the Upper Hauterivian and Barremian is mainly restricted to the Tethys, a family that Dr. JEAN VERMEULEN studied for decades. I am very pleased that he agreed to be co-author of this part of the Catalogus. Both parts in this volume have their own reference list due to the small overlap of the references and for the convenience of the reader. The following groups are in preparation: the Ancylocerataceae, the Phyllocerataceae, the Lytocerataceae, the Tetragonitaceae, the Haplocerataceae and the Desmocerataceae. Colleagues are kindly asked to communicate genera and species lacking, errors, mistakes and erroneous data in this part. Other suggestions for improvement of the text are also highly welcome. These supplementary data will be published in Lower Cretaceous Ammonites VI with references to the contributors. In addition to the acknowledgements in Lower Cretaceous Ammonites part I: I am obliged to Prof. Dr. KLAUS-PETER VOGEL (Johann Wolfgang Goethe Universität, Frankfurt am Main) from Germany, Dr. KAZEM SEYED-EMAMI (Faculty of Engineering, University of Tehran) from Iran, Dr. JOZEF MICHALêK (Slovak Academy of Sciences, Geological Institute) from the Slovak Republic for presenting their publications. Special thanks to Prof. Dr. MIKHAEL KAKABADZE (Akademija Nauk Gruzii) from the Republic of Georgia, Dr. PHILIP HOEDEMAEKER (Nationaal Natuurhistorisch Museum) from The Netherlands, Dr. TAMARA BOGDANOVA (St. Petersburg) and Dr. VASILY MITTA (Paleontologicheskii Institute, Akademia Nauk, Moscow) from the Russian Federation, Prof. Dr. ZDENĚK VAŠêČEK (Institute of Geological Engineering) from the Czech Republic and to Prof. Dr. PETER RAWSON (University College London) from the United Kingdom for providing me with additional information.